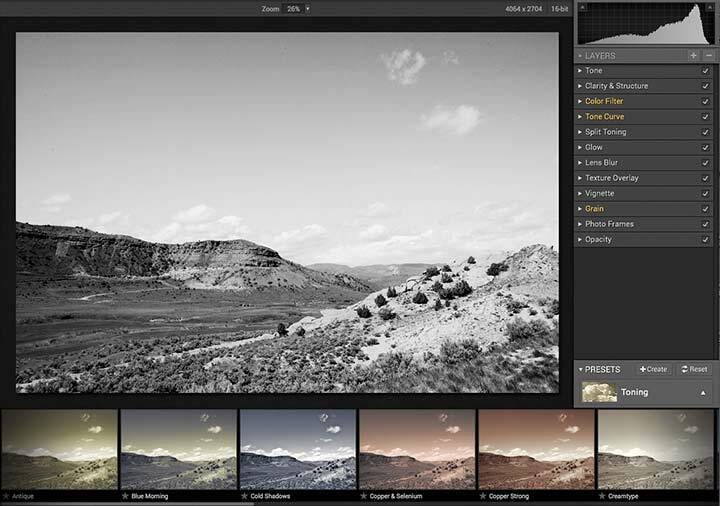 Macphun have just released a new Apple Mac software package that produces black and white (monochrome) images from colour source images. 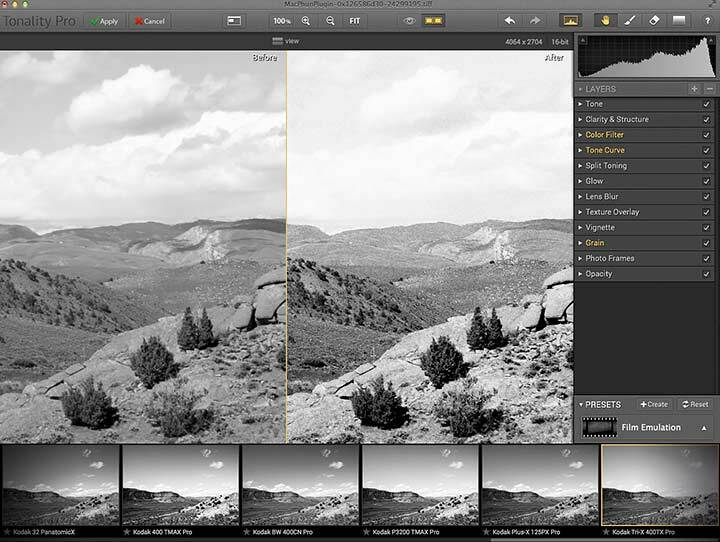 It even offers layers for combining and masking adjustments – normally associated with advanced image processing, such as in Photoshop, where it’s been a key element of Keith’s image editing workflow for many years. 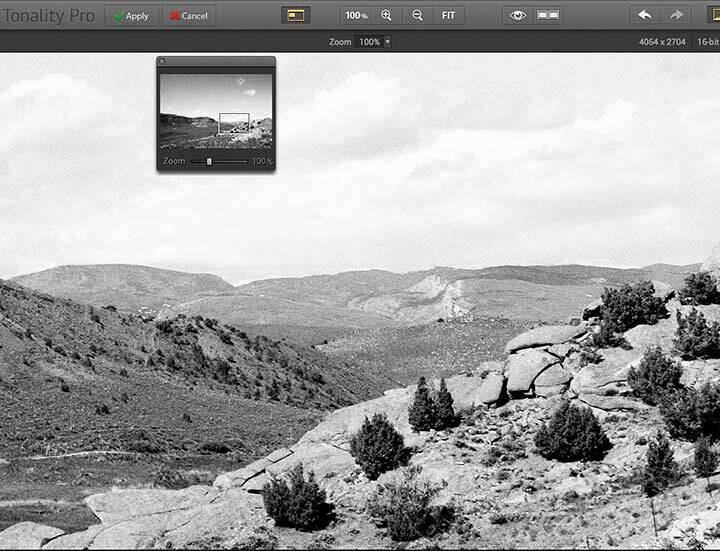 We've reviews of many MacPhun/Skylum apps. 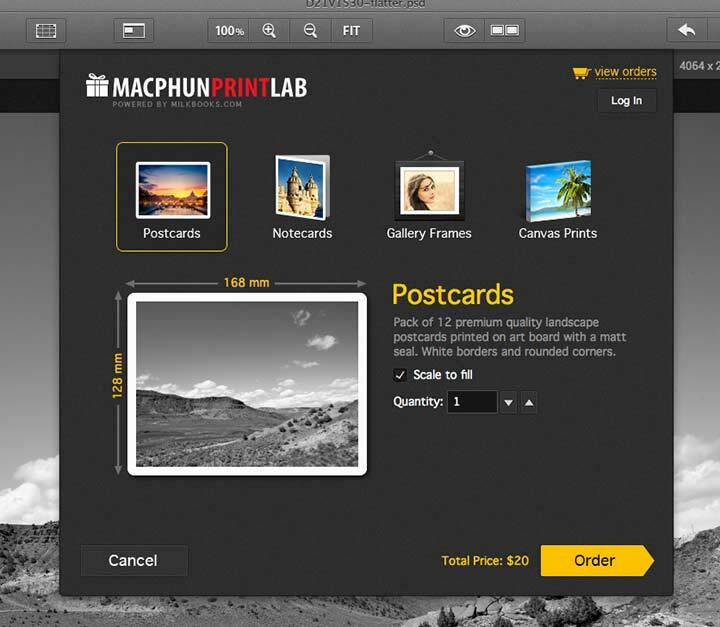 See the Macphun or Skylum Category in the dropdown menu at the top of the right column. The Pro version does add several other refinements to functionality. There are more details about functionality in the specifications and notes at the end of this article. 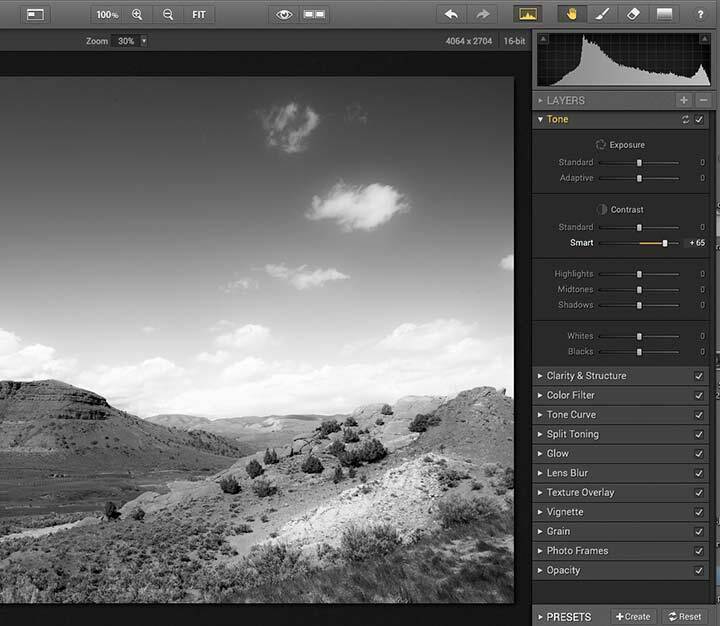 Full support of Smart Objects for Adobe Photoshop. New “Protection” slider for Clarity: get clarity enhanced where you really need it – avoid bright areas, where you don’t usually want it. 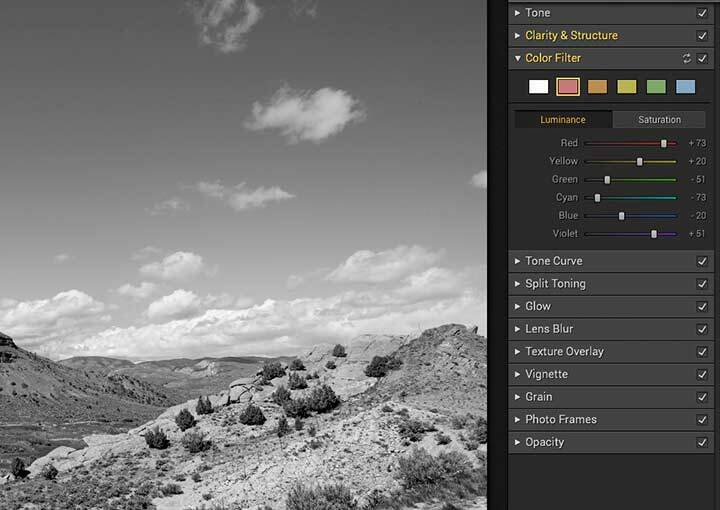 New “Opacity” slider for Lens Blur tool. Improved RAW processing and support for more RAW file formats. Improved plug-in performance with the latest versions of Adobe products. Minor bug fixes to improve reliability. I’ve long regarded the advent of digital technology as the best thing that ever happened to my B&W photography (apart from my first image appearing on a sheet of paper in a developing tray when I was at school). 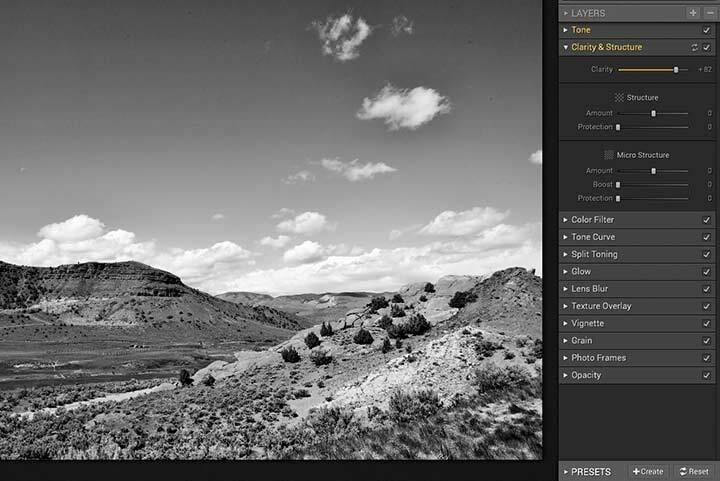 There are many articles on this site devoted to aspects of black and white photography, but one area I keep returning to is the conversion process between a colour image (the RAW file) produced by my camera and a black and white representation. If you think of a scene with multiple coloured objects in it, then there is nothing to say that a green ball should translate to a particular shade of grey, compared with a red or orange ball. This freedom to alter the balance between different colours can be used to emphasise the differences or hide them – as you see fit. Black and white images can allow me to emphasise form and structure in images, or make more use of shadows as ‘objects’ in their own right. For many of the examples in this review, I’ll be using an image I took in 2004 in Wyoming, with my then impressive 11MP full frame Canon 1Ds DSLR. I used to be a geologist, so those bright orange rocks immediately caught my attention whilst driving along. 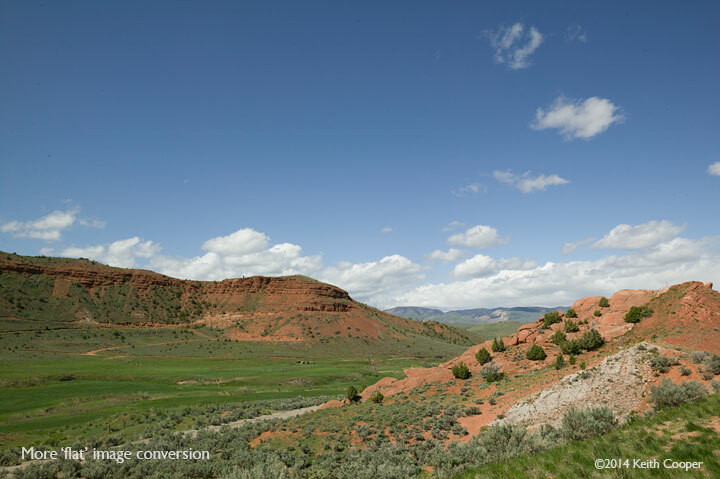 This image, with its strong colours, also shows up differences in conversion software quite easily. The version to the right is the one I started off using to test Tonality, however as I’ll show, limitations of camera technology can become more apparent when converting to B&W. 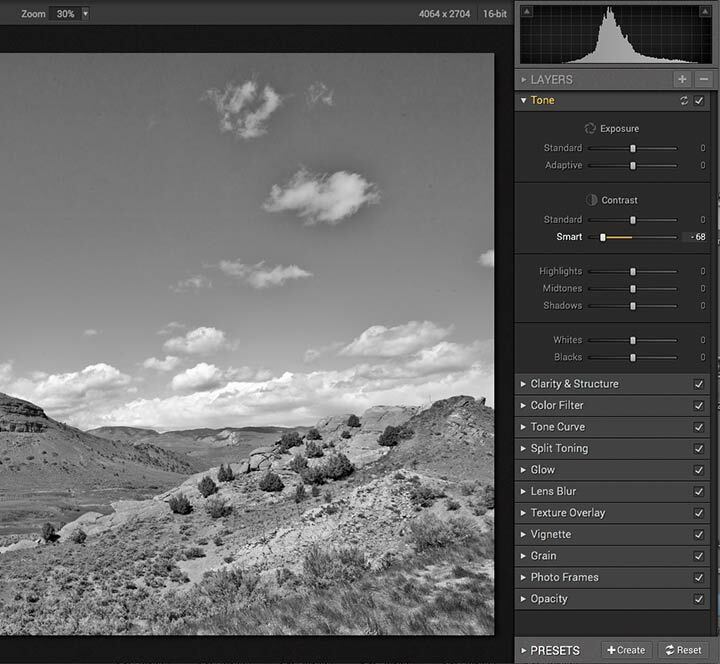 Intensify will handle RAW files, but I’ve not covered this aspect, given all the specialist RAW processing software I normally use, and that it offers no control over how it processes the RAW file. 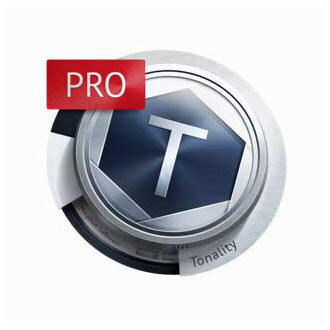 Tonality Pro – What do you get? The software will install as a trial version. This needs activating once you have purchased a copy. The software installs as a stand-alone application. 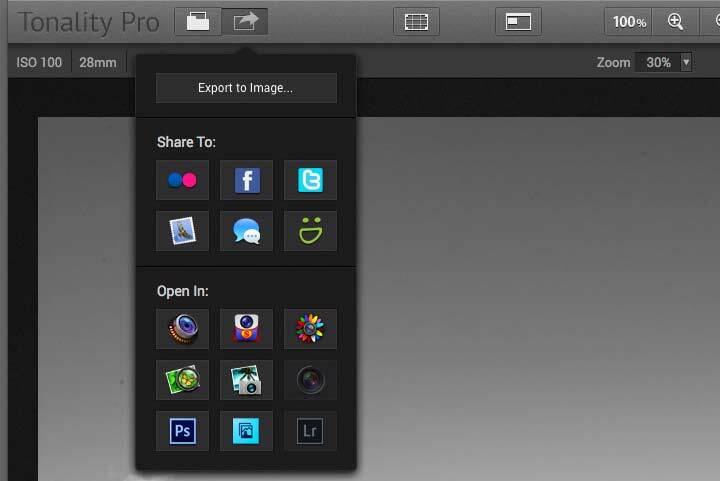 To use it as a plugin for other image editing programs, you’ll need to install the plugin options. Fortunately, the software finds any relevant software and will install as needed. 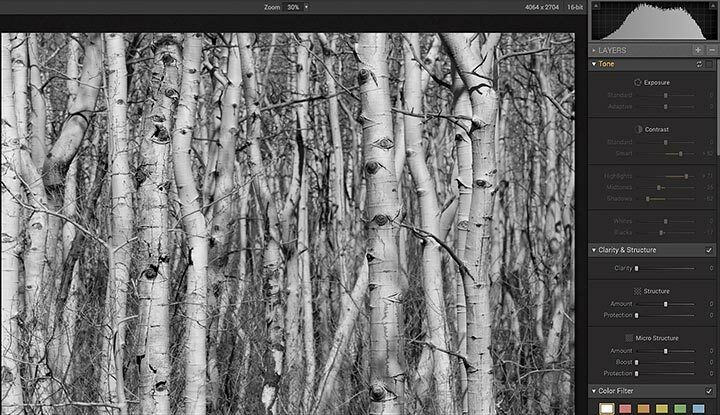 I’m using the software within Photoshop, since that’s what I often (but not always) use for processing my RAW files, and will then use for further processing before printing. 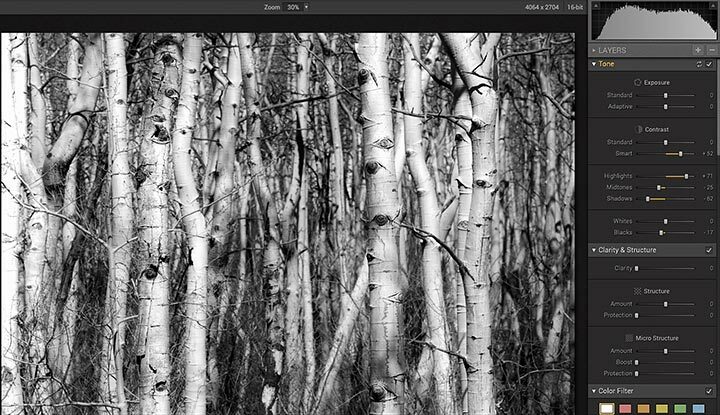 In the past I’ve sometimes found that DxO Optics Pro gives me colour files that look better when converted to B&W than if they’d been processed with ACR in Photoshop. This is by no means a universal choice, since software evolves over time. It’s also important to note that the best looking colour version of an image, does not automatically make for the best looking black and white version. I’ll show an assortment of image adjustments here, with variations to give an idea of the range of adjustments possible. As with many such packages, there a many different combinations possible, so have a go with the trial version if you’re curious. 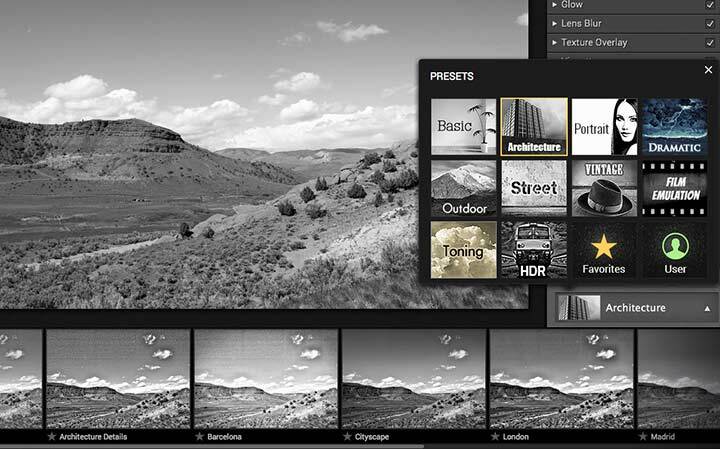 The standard view has editing options to the right and a collection of preset adjustment options at the bottom. A navigation panel can be activated. Comparison images can be viewed split screen (horizontal split available too). The presets can be hidden for a cleaner view. 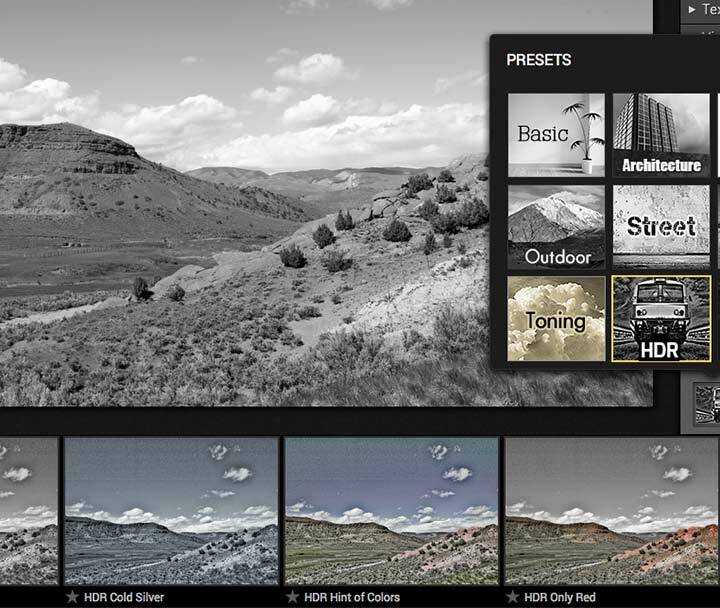 Presets are grouped into styles. There are quite a few basic options. 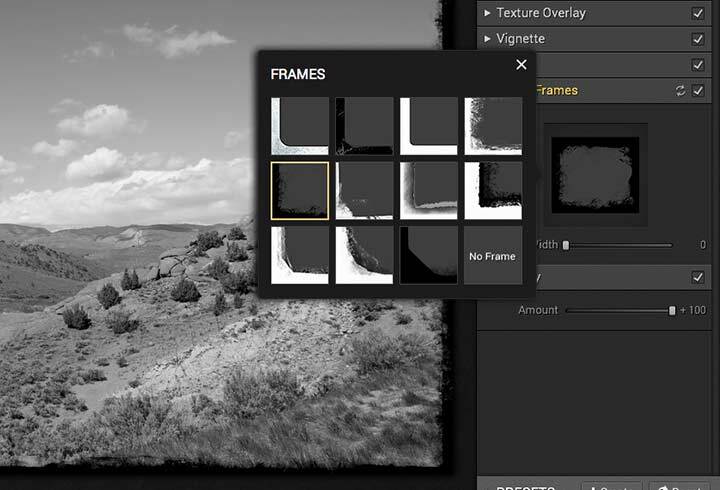 Remember that you can fine tune the settings of any preset, and create your own favourites. Quite a variety of toning options. 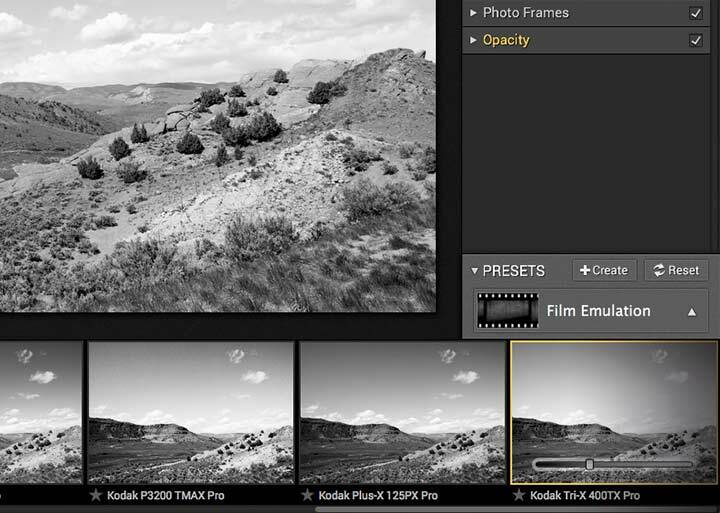 There are quite a few film emulations available. This massively zoomed view of the sky gives a feel for the grain effect. It’s for Tri-X in this instance – I’m assuming that it’s based on 35mm film. There are ways of adjusting grain contrast and softness, but not scale (grain is proportionally finer on a larger negative). 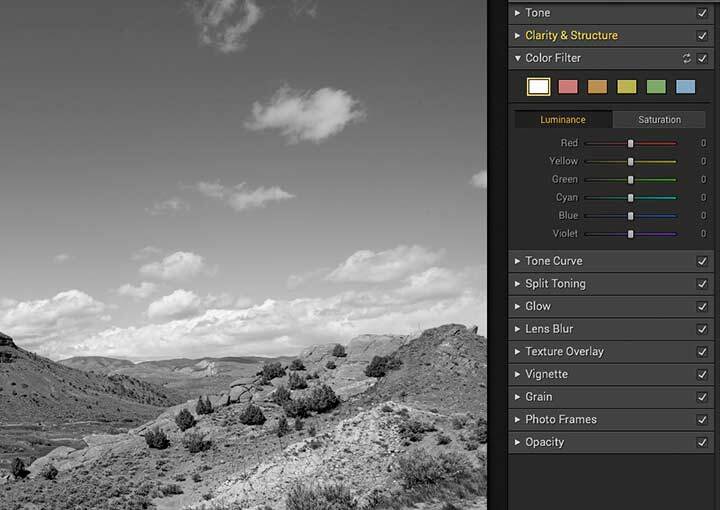 One great feature is that any preset can be turned down to more subtle settings. 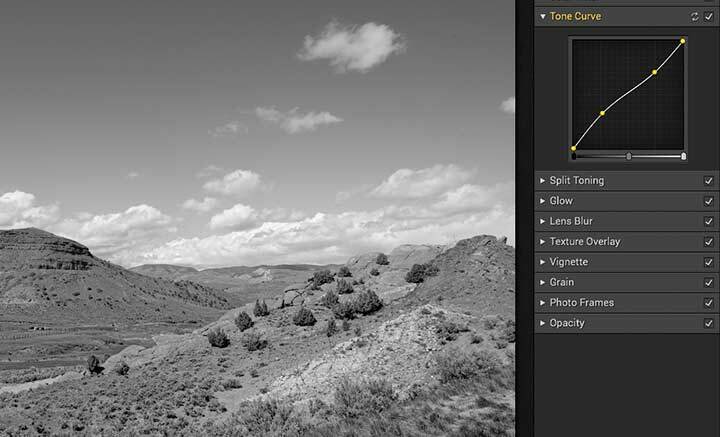 The image below show an application of the Tr-X film preset at full strength. Move your mouse over the image to see. One minor annoyance is that the display of preset thumbnails seem to be vignetted, so the ones at either end are darkened – I cannot see any benefit whatsoever in this? Whilst it’s possible to get some excellent results just using the presets (and turning down their effects), the real power of the software comes from getting a feel for how all the different adjustments affect how your image will look. One of the key features of Tonality is how you can then localise adjustments to different parts of the image, but I’ll come back to layers in a bit. A simple ‘exposure’ adjustment lightens the whole image – move your mouse over the image below to see. Note the change in the histogram too. The ‘Adaptive’ exposure adjustment is a little more complex, with results partly depended on the image content. Move your mouse over the image, as before, to see the changes, but note how they differ. 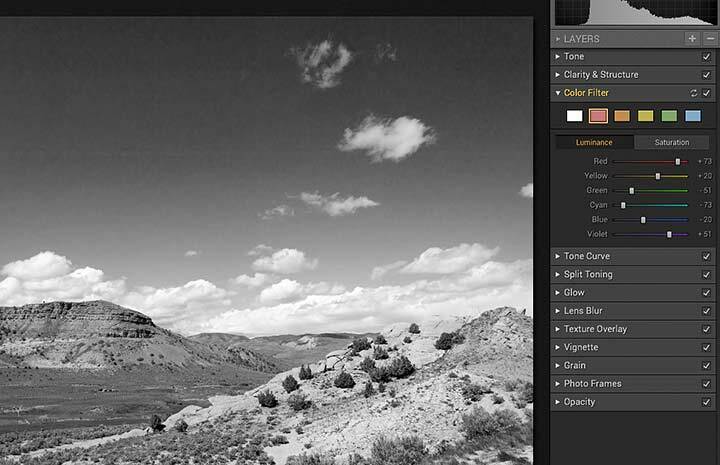 Smart’ contrast also works in a way dependent on image content (mouse over to see). Pushing smart contrast upwards gives a softness to the image – not quite what I was expecting from ‘contrast’. Pushing up ‘Structure’ brings out dust spots on the sensor, and some distinct banding in the sky. 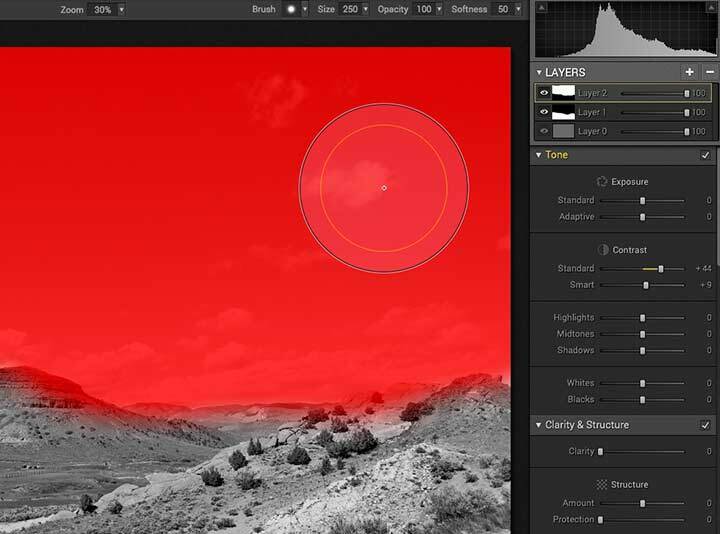 A ‘red filter’ changes the way different colours are mapped to greys, darkening the blue sky and making the orange rocks brighter. 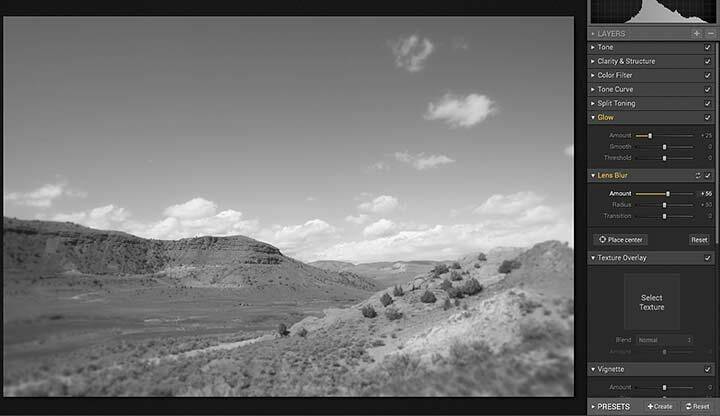 This effect is similar to if I’d used a red filter on my lens when using black and white film. What’s less welcome is the distinct banding in the blue areas of the sky. 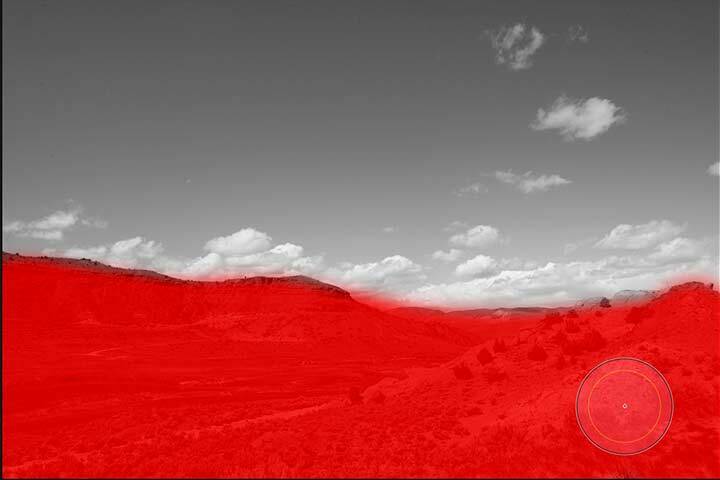 I’ve come across this before and know that it comes from enhancing the red channel, when (in a deep blue sky) there is very little red light. Remember that this image was taken with a camera sensor developed around 2002/3. It was the first full frame sensor from Canon at a time when Nikon was still saying that no-one needed full frame. I know that it exhibits banding (even at 100 ISO) that can appear in images that are slightly underexposed. It’s time to go back to the RAW file and make it a bit ‘flatter’. 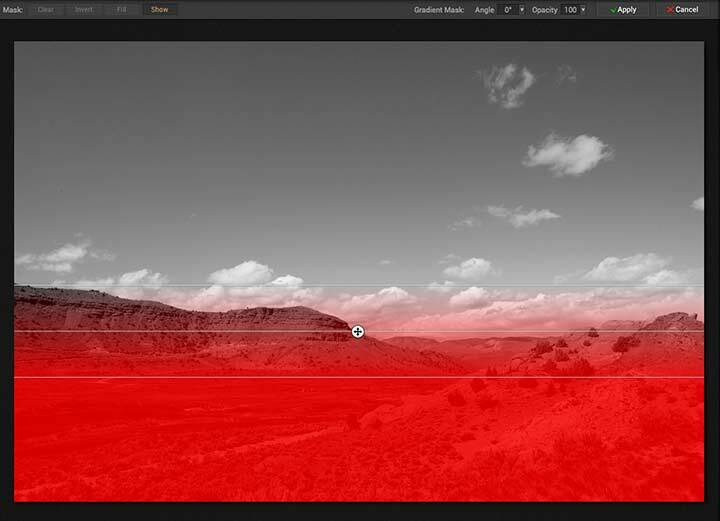 I’ve moved most sliders (ACR Photoshop CS6) to zero. The new image has had much less done to it in RAW processing. Move your mouse over what looks good in colour (yes, the colours were very vivid – one reason I stopped my car) to see the version that makes for a better black and white version. I’ve come across this effect before – have a look at my full description of the creation of a black and white print for more examples and a discussion about this. 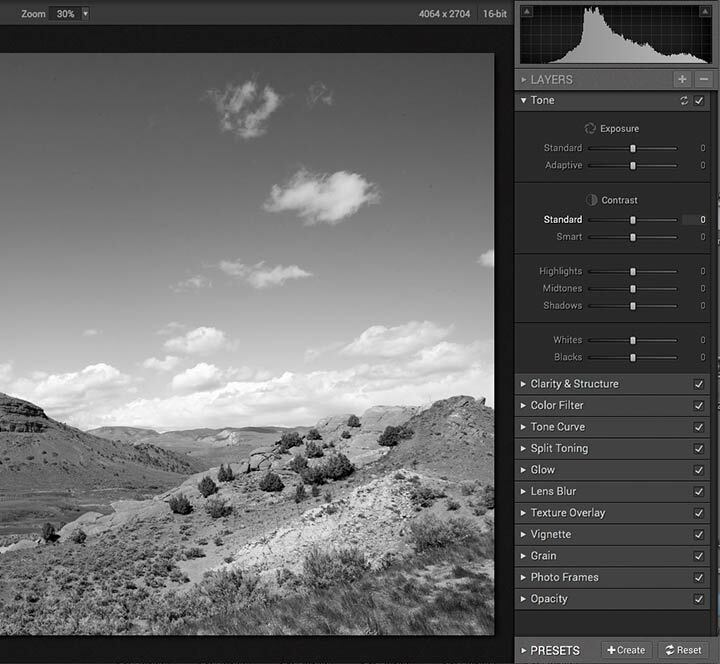 The effect can also be quite pronounced under artificial lighting, where some extreme settings of the white balance point (and tint) can help getting a far better tonal range (without clipping) for your B&W image. I’d also note that my colour images for conversion are all produced in the ProPhoto colour space and at 16 bit, to retain as much information as possible from the original camera file. 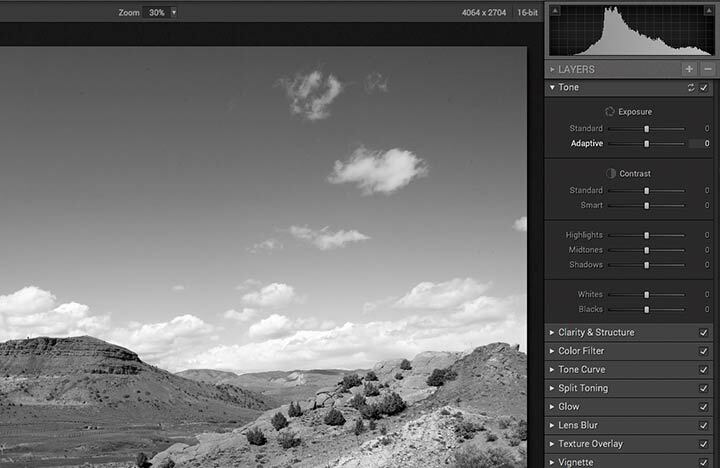 I correct for lens aberrations and apply light noise reduction at the RAW processing stage. What about if you only want to apply an effect to part of the image? Fortunately, Tonality allows you to set a mask, which decides where the adjustment will be applied. This can be painted in, or you can use a graduated mask tool (great with horizons). I’ve made the mask visible – the red area is where the adjustment will be applied. The brush size and properties can be altered, as with most painting type applications, you might have used. The angle and falloff of the gradient can be altered. Remember that you can turn the colouring off to see what’s happening. You do need to apply the mask once finished, for it to stick. Move your mouse over the image below to see the effect. I’m adding a lot of ‘structure’ but it’s not spoiling the clouds at all. One of the most powerful features of Photoshop for me is to be able to build up an image through multiple layers of adjustment and masking. 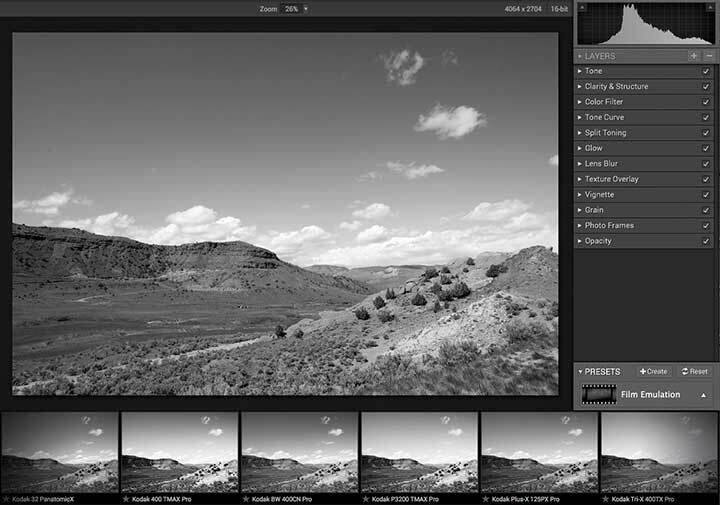 In terms of the image I’ve been using, think of one layer to set the basic black and white image, and then adding extra layers (up to 8 in the Pro version, 5 in basic) of adjustments, globally or masked. 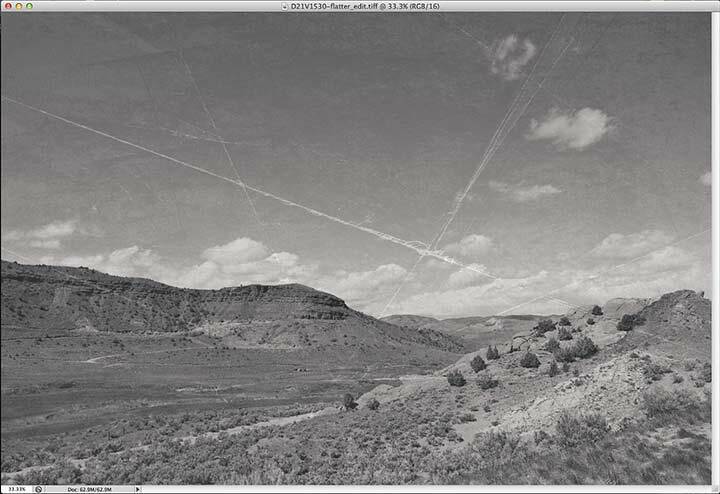 An example might be three layers for this image, with adjustments for sky and land. Mouse over the image below to see me adding a mask to a layer for the sky (painted in). 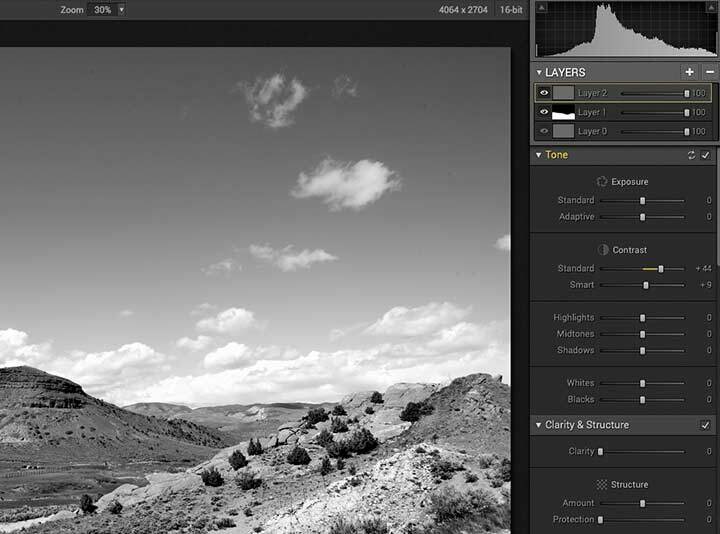 The layers are controlled in the area below the histogram. You can turn them off to check for effect, or just lower their opacity to turn down their effect. 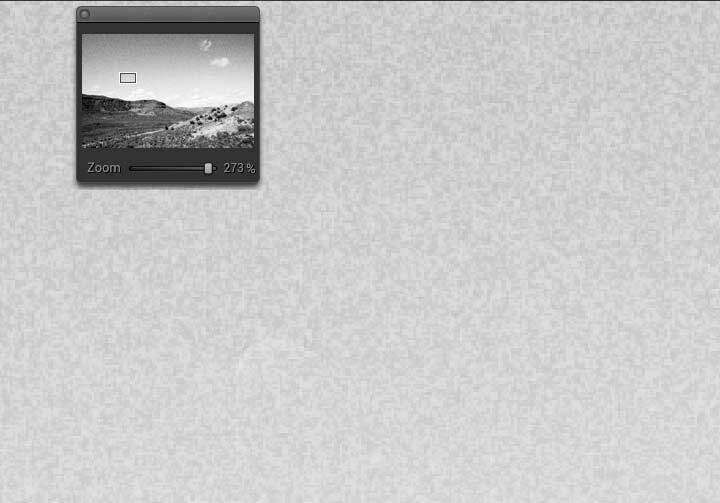 In the example below I’m reducing the opacity of a masked layer. 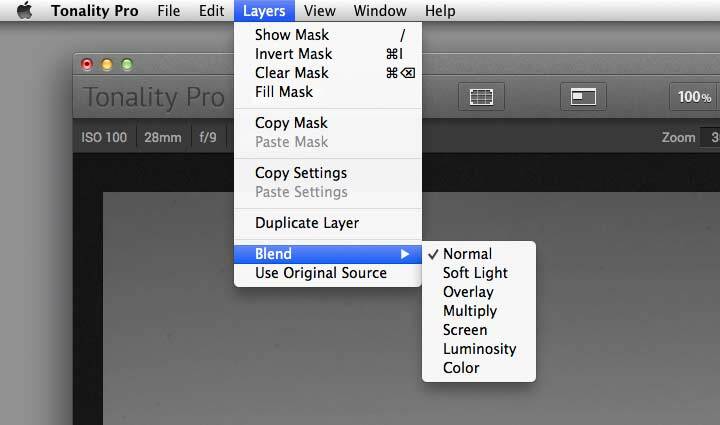 It’s also possible to alter the blending modes of the layers. Note that you can use the original (colour) source image in layers too. The whole point is that the software covers a very wide range of ways of using it, but the complex stuff doesn’t get in the way until you need it. I’ve added split toning as a layer, but you could just as well use it without layers. Glow and lens blur – just in case you have to use a camera that’s too good. A range of frame types. There are a couple of additional option in the standalone program I’d note. Printing is available – but I note the US prices. So maybe not for us in the UK? You can share images directly to a range of sites – none of which I’d normally post any of my commercial images to. The only one I happen to use (Google+) is missing. In the application, you can also crop images. First up, just altering the tone adjustment settings (turning my adjustments on/off). Both adjustments are quite minor, but the differences are quite striking. 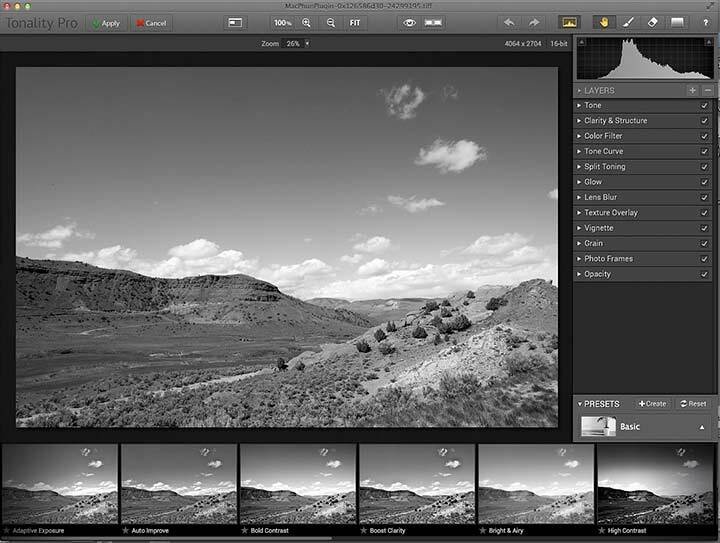 The ‘finished’ image can be exported into Lightroom or Photoshop, for example. 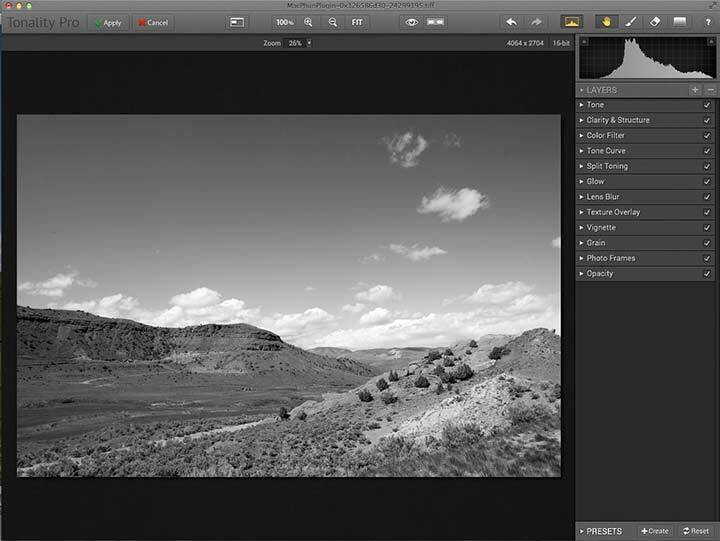 However, whether using the application or the plugin, any layers will be lost, and when using the plugin from Photoshop, there is no option to return the results as a new layer. In fact, the program almost completely eschews preferences or setting of any sort, I’m not sure this is the best solution since I might want different behaviours when using the software in different ways. 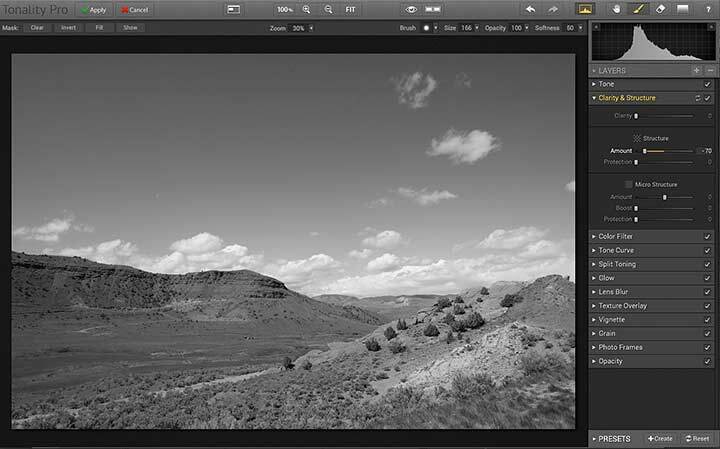 Returning as a layer is very useful in Photoshop, but not in Lightroom. Both might benefit from returning results as a smart object. It would be nice to have the choice. These are minor workflow quibbles, since it’s the way you can adjust images that appeals to me. The layers do feel a little clunky in areas, but then again I’ve been using Photoshop since the 1990’s. The whole interface for Tonality is a bit too gloomy for my taste – once more a place for user preferences. If the user wants a lighter interface, give them the option. Not many people may change it, but those that do tend to feel much more attached to it (yes, I used to do usability research before taking up photography). 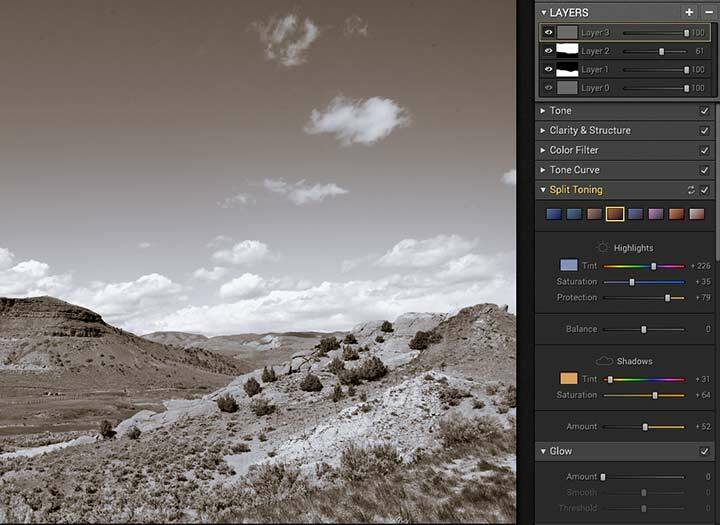 The layers and masking are to my mind, a significant benefit for Lightroom users – it’s this lack of layers that has greatly limited the utility of Lightroom to me in the past. 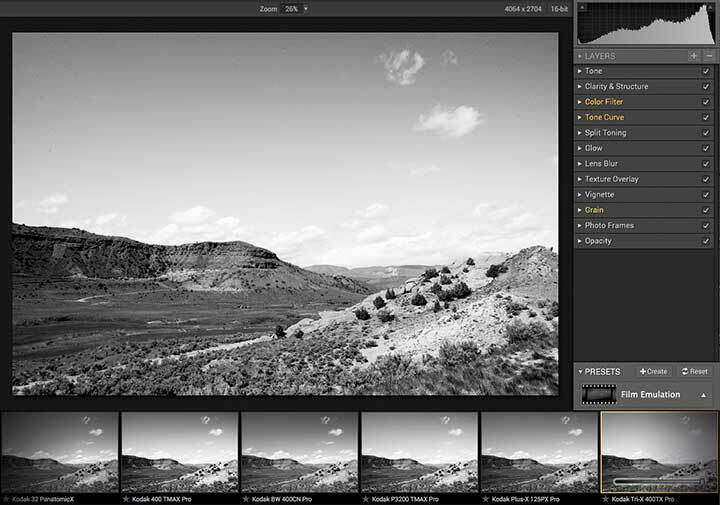 Add together Lightroom and Tonality Pro, and you have a great platform for exploring digital black and white photography, and then printing the results. Sorry Windows users, it’s Mac only at the moment. Try the trial version and see how it goes? 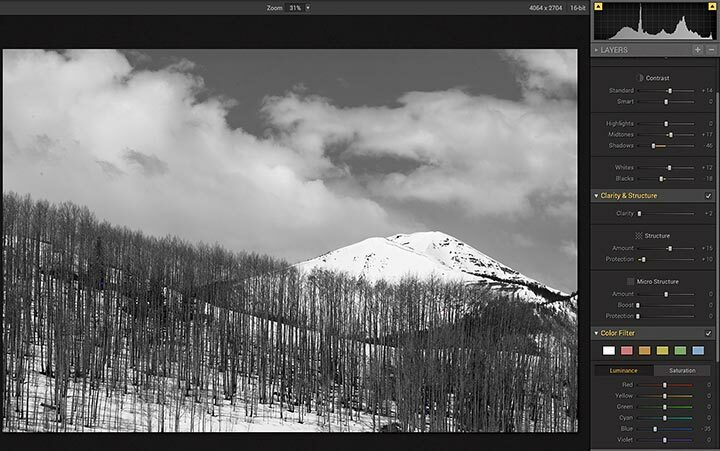 I’ve also written a lengthy review of Macphun’s Intensify Pro software, which works in similar ways to Tonality. It includes quite a few black and white examples too. Works as a standalone or plugin application.